The entire wash process takes only three minutes! Three entry lanes mean little to no wait time. We offer the only central vacuum system in Colorado Springs. We are the only car wash in Colorado with 20 covered and lit vacuum spaces. Come check out our powerful suction with no time limit! 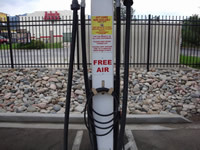 Are you tired of paying 75 cents at the gas station for that under-powered air compressor? We think air should be free! We have a high pressure (150psi) air hose located on the last canopy column before the exit. Be sure to top off your tires on the way out. Speedy Shine's site is completely fenced and secure. We have an attendant on duty at all times to make sure you are safe while washing and vacuuming your vehicle. Washing your car at Speedy Shine is much better for the environment than washing a car at your home. Please see our Environment page for more information. Speedy Shine utilizes a 14 foot spinning tire brush which cleans both the tire and rim. Upgrade to the Underbody and Wheel package for application of our wheel and brake dust cleaner. Upgrade to the Premier wash for application of our tire shine. Your wheels emerge looking professionally detailed without taking any extra time. We have had customers tell us our wheel cleaning is why they chose Speedy Shine. Speedy Shine utilizes the latest in equipment and chemical technology to ensure your car is safely and thoroughly cleaned. We use heavily lubricated foam rubber brushes and super soft Microclean cloth. The equipment applies enough friction to remove the dirt without damaging the finish. After rinsing, the vehicle is precision dried by a powerful 105 horse-power dryer. The Premier wash includes a top finish by our Buff n' Dry. Since no air dryer will completely remove all water, we rinse the car with spot free water to ensure the remaining drops won't leave water spots when they dry. Traveling down the Speedy Shine tunnel is great fun. Your kids will love the three colored foam covering the windows. Come ride the Speedy Shine Express!